In this role, she handles matters relating to eighteen departments and twelve programs covering the areas of arts and humanities, social sciences, and natural and physical sciences. 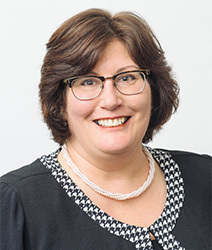 With the dean of the faculty and others in the Deans’ Office, she is involved in the recruitment and review of faculty in tenure-track and non-tenure track positions, strategic and budget planning. Culver received her BA in biology from Ithaca College in 1988, and her PhD in biochemistry from the University of Rochester in 1994. Before joining the Rochester faculty in 2007, she was an assistant and associate professor in the department of biochemistry, biophysics, and molecular biology at Iowa State University. As professor of biology at Rochester, and chair of the department since 2010, Culver has strengthened core areas of the department and continually refined the undergraduate curriculum. Culver’s research centers on the assembly of ribosomal machinery essential for growth of all cells. By focusing on bacterial ribosome, she has contributed to understanding how infections might be controlled through selective inhibition of specific control points of ribosomal assembly. Her research has received funding from NIH, the American Cancer Society, and NSF. She currently serves on the NIH Molecular Genetics A Study Section and will begin chairing this panel in fall 2014.